I was a little noncommittal in recommending the 4670 and I suspect that I’m pretty much in the same boat with regards to the 4650. On the one hand, these are inexpensive cards with impressive performance for the price, but on the other hand, for very little extra, much more capable cards can be had. But let’s say, for example, you had sixty bucks and only wanted to play WoW or the Orange Box. Will this card do it? Is it worth the ten dollar premium over a 9500 GT, or the twenty dollar (30%!) price hike for the 4670? I’m sure these questions keep you up at night, just like they do me. 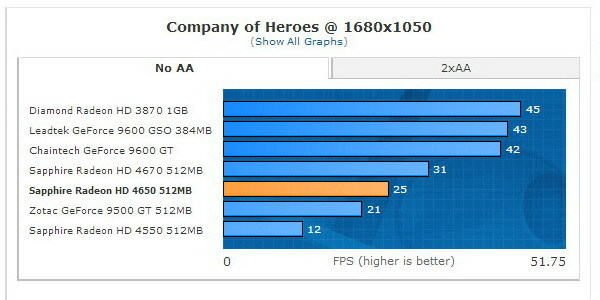 I got a hold of a Sapphire Radeon HD 4650 and can, conveniently, compare it to its contemporaries. 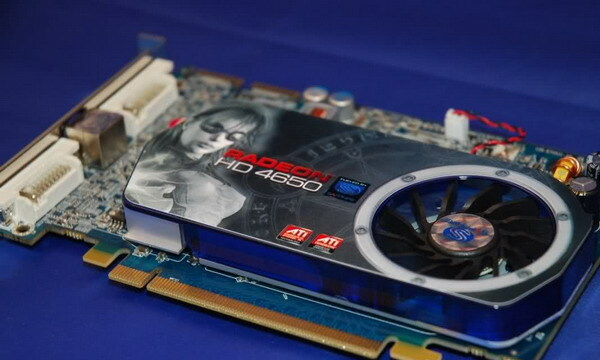 This is a stock-clocked video card, with a long, broad Sapphire-branded heatsink. I’ve named it Charles, because it’s blue. Sapphire’s packaging is nice and lean, with a small box and a very small amount of cardboard–I mention this only because we went through a period where packaging got a little out of hand, and this is a great example of boxing up only as much as what’s needed. The card’s a little longer than the slot it goes into, with a single-slot active aluminum heatsink and no auxiliary power connections. There’s a pair of CrossFire fingers at the top and the video-out goes VGA, DIN (with composite and component adapters) DVI, with an included HDMI adapter. 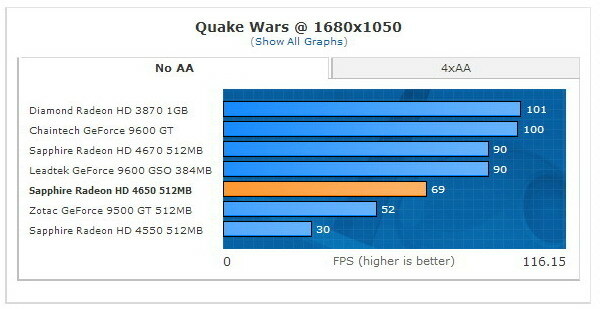 If not for the active heatsink, I’d say that this card was HTPC-ready. There’s also a paper manual and driver CD. Loaded with the latest features, the ATI Radeon™HD 4600 Series graphics cards deliver a level of gaming performance previously only found in high-end graphics cards. Redefine the way you play HD games and enjoy unprecedented levels of graphics realism powered by 320 stream processing units, up to 1GB of memory and support for Microsoft DirectX®10.1 games. Upgrade your graphics card and watch Blu-ray movies and play HD content with incredible visual fidelity1or take your experience to another level with new multimedia capabilities. Do it all with break-through energy efficiency that doesn’t compromise performance. Memory Clock: 700MHz, 1400 Mbps. With these DX 10 games, it’s clear that in some cases, spending the extra 30% for an HD 4670 equals getting a 30% speed boost. 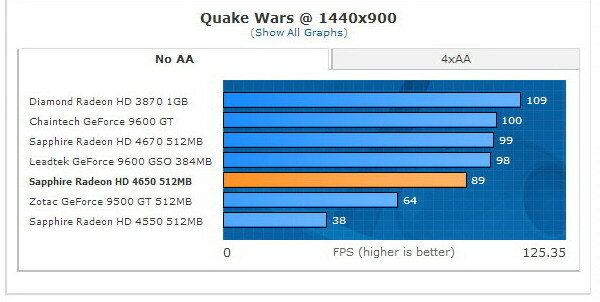 But more importantly, there are other times when the 4650 is as little as 10% behind it’s better budget brother. It also wails on the 9500 GT, which yes, costs less, but not that much less. I still wouldn’t game with it at resolutions higher than 1440×900 or 1280×1024. With DX 9 and OpenGL things are considerably better, and it’s possible to crank up the AA, even at higher resolutions. Again, the HD 4650 creams the 9500 GT. Video playback is a cinch, with technically perfect scores. Still, it’s the same as all current video playback, which is to say, there are still moiré issues. I was taken aback by how much air this heatsink moves through it. While there are passive variants of this card, they’re rare and a bit costlier. If you’re looking for silence, I think you’re best served by digging up an older HD 3850. 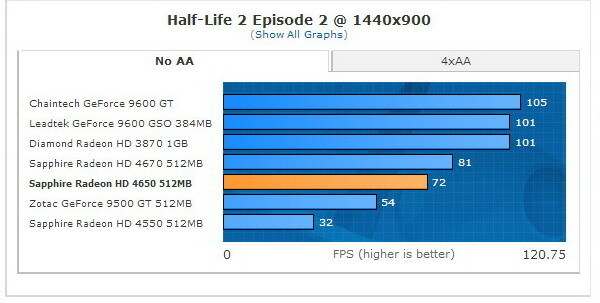 On top of it, the fan speeds picked up quite a bit when things got renderin’ hard. But this card doesn’t run hot at all, and could do well with some RivaTuner tweaking, particularly since the card uses so little power. 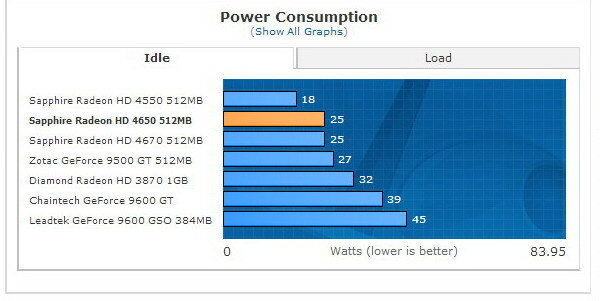 This card came in at 25W idle and 40W load, which is an amount of power I haven’t seen capable cards consume for a couple of years. 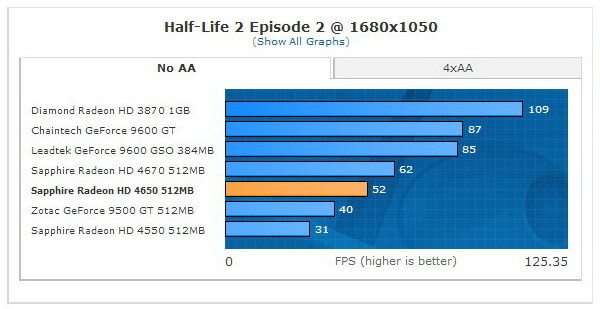 That’s a good thing, I mean; most current hardware really pegs the PSU, and this is a happy exception. Overclocking was particularly limited, unfortunately, gaining only 40MHz on the core and memory both, or a little less than six percent overall. If this card were a little more ambitious, it’d be easier to recommend. What you’d get for sixty bucks isn’t that bad, actually. It’s shocking to think that a couple years back this card would have cost a hundred more, easily. But for a mere twenty additional dollars, you can get better hardware, and for a cool Benjamin, some really fine hardware. Of course, for those of you who can’t justify the extra price or afford it, this card’s pretty good. 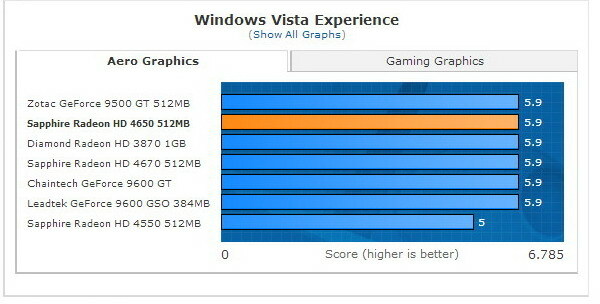 Especially if you’re replacing an aging 2600 XT or something, I think you’ll find this card will do well if not better. Its failings are few, namely, it’s a little loud, but you can fix that with some third-party software and the low power consumption and general value make up for that in spades. That is to say, if you’re replacing an old video card then this is a perfectly acceptable option, but if you’re putting together a new machine, do everything you can to get some heavier hardware. It’s not that this video card is bad or weak, it’s that right now, there are many, many more powerful options that cost an insignificant amount more–squeeze the extra out of your build budget, your gaming self will thank you.